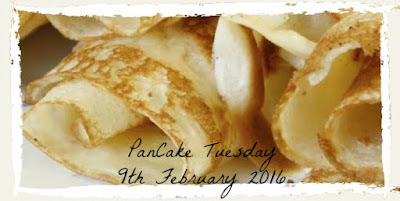 Purple Button Couture: Happy Pancake Day! Yum Yum!!! 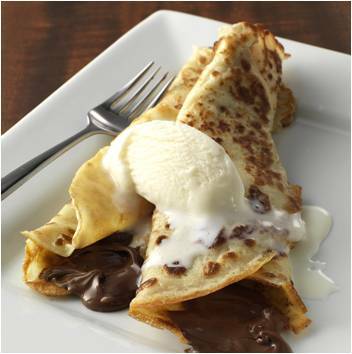 I love Pancake Tuesday! A whole day dedicated to stuffing yourself with pancakes! So here is a recipe for pancakes from Odlums, get the whole recipe here! Or this one from Siucra, see full recipe here! I used this Siucra recipe this year as this is the one I had as a child, Siucra used to give recipe cards out in the supermarket so I used to pick one up every year! I used oil instead of butter. simply put all your ingredients into a jug and mix it up with a whisk! It is best to leave it stand for 30mins or overnight however I had some "tester" pancakes last night and they were delicious! 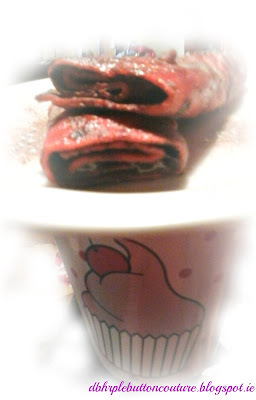 Last year I made Red Velvet Pancakes (using the Odlums recipe) by adding red food colouring and cocoa to my pancake batter!!! Then I covered them with Nutella, and strawberries would have gone great with them!!! Here they are with a nice cup of tea! My favourite Pancake though is the Traditional Sugar and Lemon Juice!!! However you like your pancakes I hope you enjoy them!!!! P.S. Feel free to comment and send me links for recipes you think I should like! Thanks hun! Love Pancakes! So tasty spent four days eating them!! !